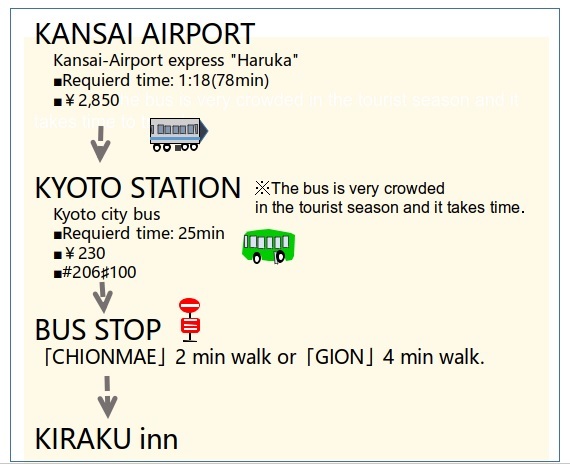 We show you how to get to our inn from Kansai international airport, Kyoto station and nearest station. Route 1:Kansai-Airport express “Haruka”→City bus. 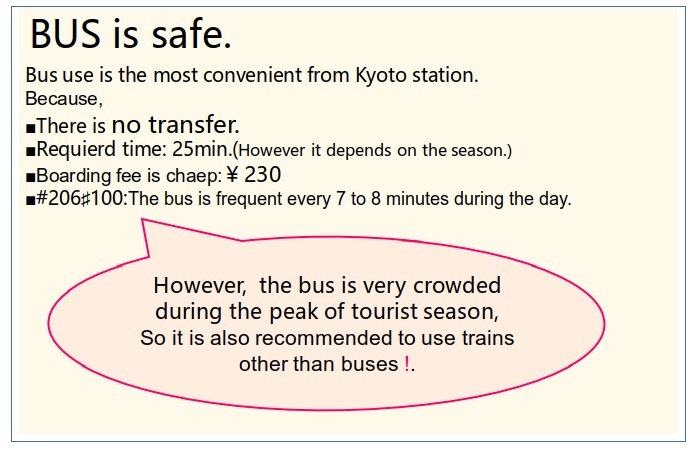 The safe way to get to our inn from Kansai Airport is to take Airport Express “Haruka” to Kyoto Station and use the bus from kyoto Station. » ①It is easy to there is no transfer other than Kyoto station. » ②Total required time is about 1 hour 30 minutes .Not a long time. A limousine bus is operated from Kansai International Airport to the nearest station of our inn. Relaxed without transferring. To see the details of the limousine busplease click here. 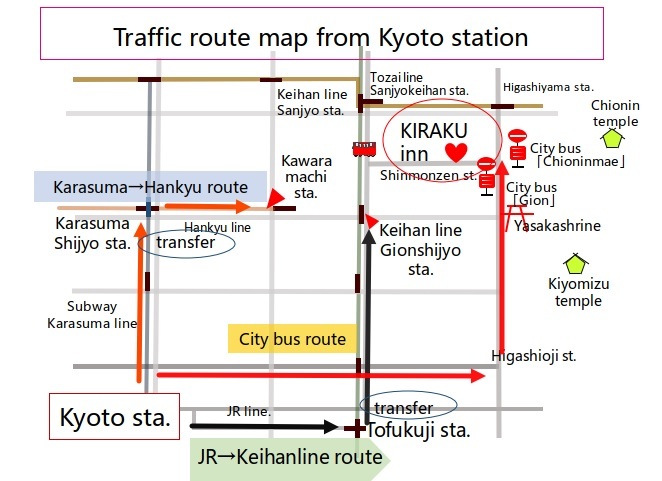 To see the details of 「Route map from Kyoto station」click here. The distance from Kyoto station to our inn is 4.2 km. Taxi use is also recommended. It takes about 10 minutes to 15 minutes. Price ¥ 1200 or so. To see the detail of nearest stationclick here. Time and distance from the nearest station is…. 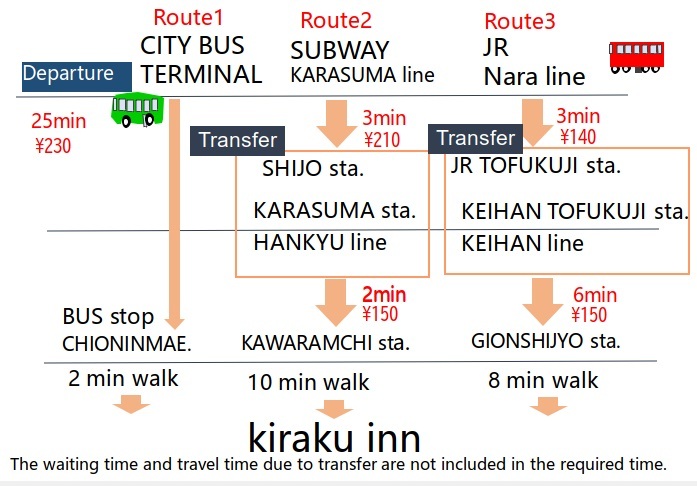 First, get off at “Chion-in Temple” bus stop 2 minutes walk or from “Gion”bus stop 4 minutes walk . 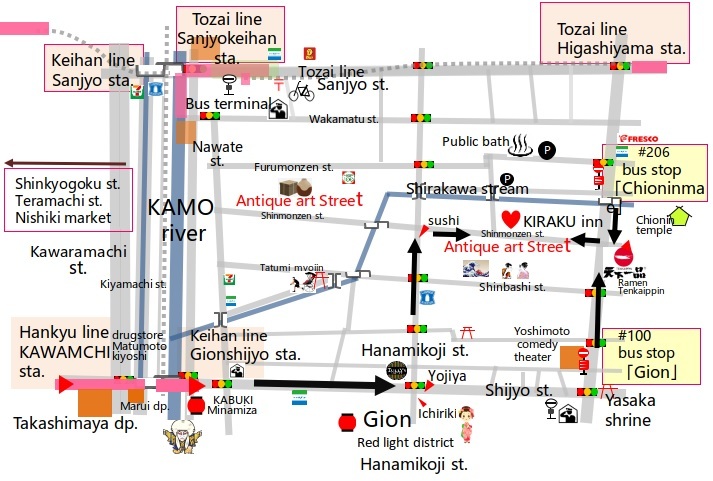 Next it is an 8-minute walk from Keihan line “Gion-Shijo”station and 10-minute walk from Hankyu Line “Kawaramachi” station. And there are other methods below. Address : 251, Umemoto-cho, Sinmonzen-dori, Higashiyama-ku, Kyoto-city, 605-0064, Japan.